As an artist, I've never selected one preferred medium. That choice is dictated by my artistic muse. Through the years it's changed its spots and stripes. In my college years I focused on painting and clay. Then it became photography and clay, then only clay, then kiln formed glass and today its kiln formed glass, painting and plasma cut steel. I never work with only one medium. Working with different disciplines (mediums) at one time keeps my ideas and work fresh, my mind moving to new solutions. I get stagnated and repetitive if I work with one medium too long. And I get bored unless things move and creative ideas are born. Kiln formed glass offers an open-ended challenge I can explore. In 2002 it became my number one medium and to counterbalance it, I relaunched the oils and added mixed media encaustics. 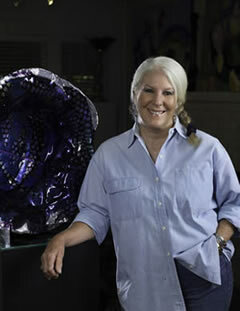 I use color and texture to create energetic, luminous, joyous works with the glass. Bright, bold color using reds, blues, oranges reflect my travels in color saturated countries such as Tibet, Nepal, China and Mexico. At random I use solid color fields as a challenge to my driving love of vibrant color. My favorite themes are inspired by nature and antiquity. The message I want to convey is a joyous, energetic rendezvous with positive directions. I'm pushing for a smile and can-do attitude - starting the day with that! Kiln formed glass uses flat sheets of glass which are cut into shapes, layered and incorporate accessory elements of frits, copper wire and mesh, pieces of sheet copper or brass and dichroic glass fired in a kiln. The temperature I fire to is dictated by the desired effect and is usually between 1200 and 1500 degrees. The firing time can be days and often times multiple firings are necessary to complete the piece. Patience is essential. I love working with kiln formed glass for the technological challenge of mastering kiln firing, the complexity of the medium, and the never ending possibilities of design, color and theme. The joy of glass is the light which plays through the piece. As he time of day changes so does the art. It never stays exactly the same. Its a delightful, challenging dance.